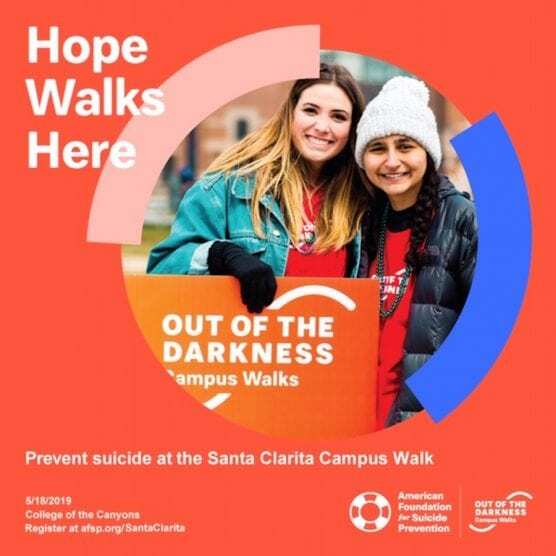 The American Foundation for Suicide Prevention (AFSP) will host the inaugural Out of the Darkness Campus Walk, Saturday, May 18, at College of the Canyons, Cougar Stadium. The event is meant to raise awareness on mental health. Illnesses do not discriminate. The walk is about bringing the community together and making sure that we create an environment where it is OK and encouraged to talk about mental health. Be a part of the movement turning hope into action, and create a culture that’s smart about mental health. Funds raised at the walk will benefit AFSP. For more information or to register, go to www.afsp.org/santaclarita. Please note: Online registration closes at noon (local time) Friday, May 17. However, anyone who would like to participate can register in person at the walk from the time check-in begins until the walk starts. Walk donations are accepted until June 30th. For more information, please contact Dawnel DeRubeis at (661) 313-1793 or at dk@derubeisfineart.com.